12 February 2015, Doha, Qatar Racing & Equestrian Club ~ H.H Sheikh Mohammed Bin Khalifa Al Thani’s Gazwan (Amer x Arc De Ciel) came up with a stunning gallop down the final straight of the 1600m turf race for 4-yr-olds to win the Julaihah Cup for Arabians. The Jullian Smart trained Gazwan with Marco Monteriso up steadily covered position and in the final furlong stretched away in fine style to win by three lengths. Bahess Des Vialettes finished second ahead of Zameer. H.H Sheikh Mohammed Bin Khalifa Al Thani’s Gidwa (Amer x Djamour Des Forges) scored a win in the Sadari Wasett Cup, Pure Arabian race over 1600m. Smart trained Gidwa with Tadgh O’Shea astride shot to the lead inside the final furlong and stretched away to win by five lengths from Badriya Thabeth, while Radwah finished third ahead of Azeeza in the seven horse race. This is the second win for Gidwa in two outings. H.H Sheikh Mohammed Bin Khalifa Al Thani owned Mazen made every post a winning one as he raced to a start to-finish victory in the Al Busayyir Cup, Local Bred Pure Arabian at 1850m. Smart saddled the Amer-bred Mazen and he was ridden to victory by jockey Tadgh O’Shea. Ain Jalout finished a half length behind the winner. Al Fakhamah and Naamah finished third and fourth respectively. Umm Qarn’s Safwan (Nizam x Cheri Bibi) was ridden to victory by jockey Gaetan Faucon in the Local Bred Pure Arabian Conditions Maiden Plate. The Alban de Mieulle trained Safwan held on gamely to win by a head from a Al Sardal to take his maiden win in two starts. Al Mundher and Sirat Al Naif finished third and fourth respectively. Mishal Bin Ali Al Attiya owned Al Hareth was ridden to victory by Harry Bentley in the Al Bushayriyah Cup, a Local Thoroughbreds race for four-year-olds. Mohammed Kazim Al Ansari & Son’s owned Crescent under Gerald Avranche came through a rough passage and with a brilliant burst of speed in the final furlong, overhauled the front runner and won the Marmi Cup, a Thoroughbreds race, run over 1,600 metres. H.H Sheikh Mohammed Bin Khalifa Al Thani owned Sherston was a comfortable winner of the Thoroughbred Maiden Plate for trainer Jassim Al Ghazali under jockey Harry Bentley. Jassim Mohammed Al Badi’s Ashkal (Manifik x Ba’scherit) produced a sparkling run in the final 100 metres to get the better of stable mate Sahaba Al Uraiq to win the Umm Al Zubar Cup, a Pure Arabian race for Fillies and Mares, which featured the 31th day’s races at the Racing and Equestrian Club on 11 February. The Jassim Al Ghazali trained Ashkal was ridden to victory by jockey Yanis Aouabed. Sahaba Al Uraiq finished a neck behind the winner, while TM Raegan Bret and Hassiba completed the frame. Combining two great racing stamps, the H.H Sheikh Mohammed Bin Khalifa Al Thani owned Qaa’ed (Amer x TM La Belle Proper by Burning Sand) broke through the maiden ranks with a comfortable victory in the Pure Arabian Maiden Plate. 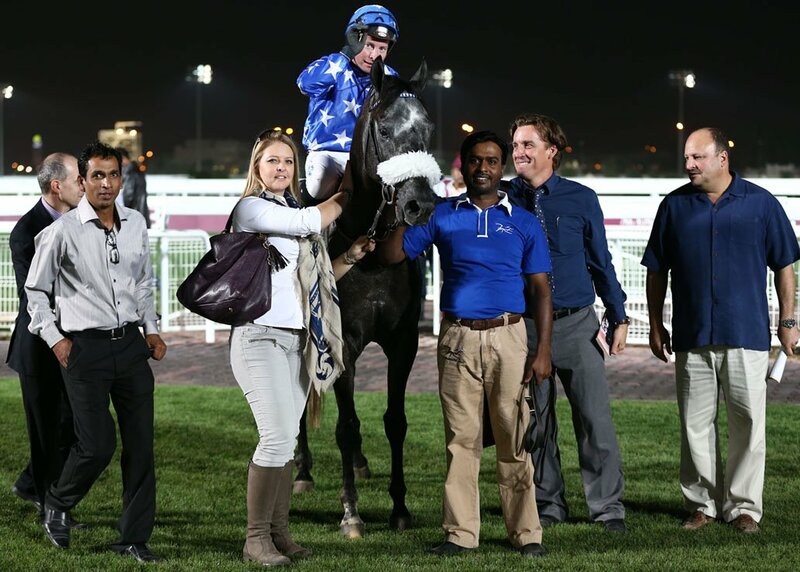 The Jassim Al Ghazali trained Qaa’ed was ridden to victory by jockey Harry Bentley. Al Taweel was two and half a length behind in second, while Tadmur and Farashat Yasmina finished third and fourth respectively. H.H Sheikh Mohammed Bin Khalifa Al Thani owned Refaal (Majd Al Arab x Dixie Darlene) was ridden to victory by Richard Mullen in the Pure Arabian Graduation Plate. The Jullian Smart trained Refaal was in the front as the field straightened out for the home stretch but once put into top gear, the five-yr-old grey stretched away nicely to win by three lengths from Ladys Sandman that finished with a late dash to pip Khafouqi for the runner-up berth. Injaaz Stud’s Hab Reeh (Hatteen x Quinquinna) with Harry Bentley astride scored a fluent victory in the Pure Arabian Handicap for horses rated 70 to 100. Ghazali trained Hab Reeh shot to the lead inside the final furlong and stretched away to win by two and half length from Maazouzand Al Khattaf.